Why not put cryptography in the browser? Isn’t it inevitable? This is a perpetual refrain from various encryption products which target the browser (names and addresses intentionally omitted). While the smarter ones try to mitigate certain classes of attacks by shipping as browser extensions rather than just a web site that a user types into their address bar, there is definitely a push to a model where you can get the latest greatest crypto code by typing a friendly address into your URL bar. What’s wrong with this? And will WebCrypto fix it? I don’t think so. Let’s look at the good, the bad, and the ugly of in-browser cryptography and the WebCrypto API. As the API is meant to be extensible in order to keep up with future developments within cryptography and to provide flexibility, there are no strictly required algorithms. Thus users of this API should check to see what algorithms are currently recommended and supported by implementations. So, in fact, the W3C is not telling us what algorithms to use at all. Instead, the normative parts of the specification cover abstract APIs for things like generating secure random numbers, managing keys, encrypting/decrypting, backgrounding computation inside workers, and abstract types that can be used with a variety of algorithms. In that regard, the normative parts of the specification are totally fine. While the spec doesn’t cover it, the APIs seem sufficiently abstract to allow them to easily map onto future encryption algorithms and trusted platform modules (TPMs) which could provide secure storage for encryption keys. The W3C has elected to make advice on algorithms a non-normative part of the specification. This leaves browser vendors without any specific standards upon which we can build an interoperable cryptographic ecosystem for the web. Instead, the section on algorithms lists a bunch of examples of common algorithms and how they can be mapped onto WebCrypto’s APIs. Browsers already ship portable versions of a large number of cryptographic algorithms as part of their TLS stacks. Without normative guidance from the WebCrypto specification itself, what is likely to happen is that browsers will expose the algorithms in their TLS stacks directly to the browser. Some of them are fairly good (e.g. AES-GCM), but many of them are dangerous if used improperly, like pretty much any other symmetric cipher they list which is not AES-GCM, as these are not authenticated encryption modes and in the hands of amateurs are akin to handling plutonium. Without someone providing normative advice that all browser vendors can adhere to, my worry is that the WebCrypto ecosystem will fragment and fail to agree on particular standards. My advice to the W3C is to listen to cryptography expert Matt Green’s advice and provide a normative list of authenticated encryption algorithms (and only authenticated encryption algorithms) that all browsers should support. AES-GCM would be a good start. There is no beating around the bush: the browser is a sandbox that attempts to let you dynamically download and run potentially malicious code from a server on-the-fly. Web browsers are a deliberately designed engine for remote code execution, a term which strikes fear into the hearts of information security professionals worldwide. If ample precautions are taken (which includes a large laundry list of things like TLS, CSP, CORS, proper HTTP headers, JS strict mode, and more), this can allow for the successful development of cryptographic applications that attempt to enforce the interests of the web application creator. But what about the user? Do programs in the browser represent the interests of the user? According to Commander Douglas Crockford (image at the top of this post) the answer is a resounding NO. 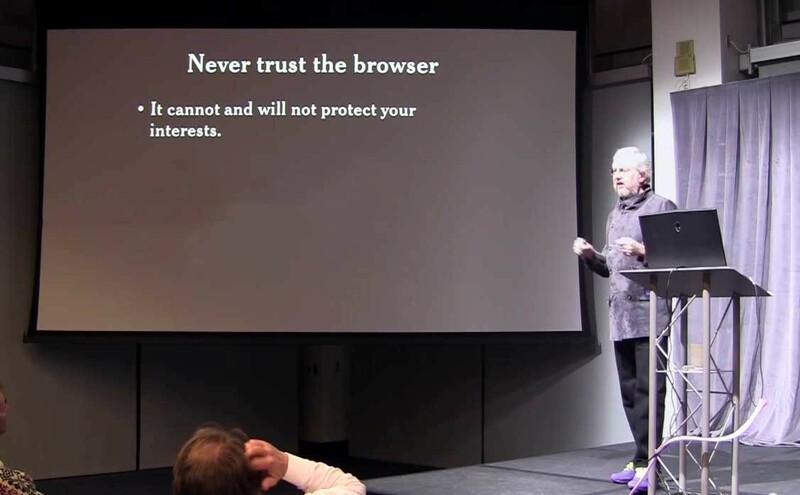 This is not the traditional threat model of the browser. The threat model of native code is now well-understood and increasingly addressed through more sophisticated software installation and update systems. Native code releases are artifacts at a point in time, don’t change dynamically, and can therefore be audited and given approval by experts (who ideally have access to the source code and can match the official binaries). This is not the case for the web platform. In this approach, there’s an implicit trust relationship between the user and the site they’re accessing. What we see happening here is cryptography being used to protect the web site’s interests, not the user’s. For this purpose, in-browser crypto is great! Where the web encryption model fails is when we want to provide a “Trust No One” service which protects the user’s interests, for example the MEGA storage service which uses in-browser crypto. In this sort of scenario, we have MEGA wanting to act as a sort of dumb store for encrypted data, and have them never see plaintexts or encryption keys. Such a service would, ideally, pass what cryptography expert Matt Green calls the “mud puddle test”, where a person who has a particularly bad run-in with a mud puddle and loses their personal copies of encryption keys can’t ask the service to give them back, since the service itself doesn’t hold onto them. The potential attacks are numerous: hackers (or governments) could compromise MEGA’s servers and change the file. A MEGA insider could place a malicious payload inside this file. Governments could coerce MEGA into placing a malicious payload inside the file. Or MEGA could just decide they want to grab everyone’s keys. If any of these things were to happen, the security of the entire system has been lost. The web’s dynamic nature precludes our only defense against these sorts of attacks: audits by security experts. Even if crypto experts were to audit MEGA’s SecureBoot.js and give it a clean bill of health, there’s nothing to stop anyone who has sufficient access from injecting a malicious payload into it at any point in time. They could even selectively target users, so the rest of the world would still think it’s fine, but a particular victim would receive the malicious payload. One way to mitigate this is to use browser extensions, which provide cryptographically signed software updates in a way more akin to traditional native code applications, helping mitigate the “just grab the latest code off the server any time I access the site” problem. Browser extensions have problems of their own, but they do move the security bar forward over a traditional web page. Some of you might be thinking “if I use HTTPS, isn’t the content signed by the server?” It’s true that, after years of resolving mistakes and design flaws, and when the certificate you’re trusting hasn’t been compromised, HTTPS will ensure the integrity of the content between the remote web server and your web browser. Modern browsers support AES-GCM, which is particularly good at this. However, HTTPS was designed to protect what’s known as “data-in-motion”. This means that HTTPS servers use online keys which are not only easily compromised, but they’re specifically designed to make it easy to send back data to users. Better software update systems are specifically designed to encrypt “data-at-rest”, which is how build artifacts of native applications or even a web site’s static assets should be thought of. The advantage of data-at-rest is it can be signed by offline keys (or a combination of offline and online keys) which are much more difficult to compromise. For more information on the problems of using HTTPS alone in the hopes of building a secure software delivery system, see section 4.1 “PKI Vulnerabilities” in the Survivable Key Compromise In Software Update Systems paper. Cryptography is a systems problem, and the web is not a secure platform for application delivery. The web is a way to easily run untrusted code fetched from remote servers on-the-fly. Building security software inside of web browsers only makes the problem harder. In-browser crypto is best utilized to help web sites protect their own interests. Sites attempting to build “Trust No One” cryptosystems inside of browsers (especially when not using browser extensions) have vast attack surface and are fundamentally attempting to use the browser for something it wasn’t designed for: creating software that respects the user’s interests, not the web site provider’s. Instead, prefer either browser extensions or open source native tools. Look in particular for tools that have been audited by security professionals, and in the case of native code apps look for tools with binaries that can be reproduced from the original source code. Scrutiny by experts in paramount in making sure software is secure, and the web, as it exists today, makes this sort of scrutiny impossible.